You are here: Virgin Islands News Online » News » UPDATE: Dameon Percival In! Marvin Blyden out! 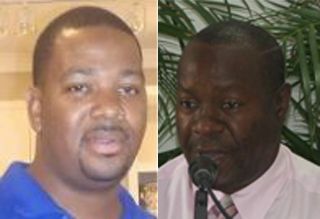 Virgin Islands News Online was the first to break the story in August 2012 of Dameon Percival's (left) appointment as the Director of the Taxi and Livery Commission. The Chairman of the Commission Marvin Blyden has resigned in protest over the appointed as Mr. Percival was not the first choice of the Commission who conducted the interviews. However, information reaching this news site is that because Mr. Percival was not the recommendation of the Commission, the Chairman Marvin Blyden, has last month tendered his resignation in protest to what he described privately as political interference. As of news time Mr. Blyden could not be reached for comments, but according to this news site’s many sources inside the ruling National Democratic Party (NDP) Administration the subject Minister Mark Vanterpool was the one who took the paper to Cabinet seeking the appointment of Mr. Percival, a former NDP youth activist. The appointment was approved by Cabinet even though Mr. Percival was not the first choice of the Taxi and Livery Commission who conducted the interviews. The role of the Director is to work with the Commission to oversee the taxi industry and the operational aspects of the Road Traffic (Taxi Cab) Amendment Act which came into effect last year under the Virgin Islands Party Government. The powers of the Director via the Commission includes, carrying out safety inspections; removing any vehicle for hire found to be operating in an unsafe manner; monitoring authorized taxi stands and ports to ensure compliance with regulations; and otherwise enforcing regulations. The Taxi and Livery Commission was chaired by Marvin Blyden, and made up of a representative from taxi operators on Tortola; taxi operators from the sister islands; and a representative of the livery services in the Territory. Ex officio members include the Permanent Secretary in the Ministry of Communications and Works; the Commissioner of the Department of Motor Vehicles (DMV); and the Directors of the BVI Tourist Board and the BVI Ports Authority. Mr. Percival is expected to report to the Permanent Secretary in the Ministry of Communications and Works and will earn a salary of over $48,000 per year in grade 14. The Taxi and Livery Commission Office is located in the DMV Headquarters at Pockwood Pond, on the main island of Tortola. hold up is that the guy who got in trouble with cell phones at cct..but how come he get this work??? Well them had mines two elections in a row, but I could tell them, I am jumping off their band wagon, I aint getting on VIP own but I definately jumping off NDP own. Same game different players. Only in the BVI buddy. i cannot believe this???? whatever happen to the cell phone case? He get the wuk because he is at home and deserves to work. A lot of criminal from other countries are working here, and no one comments because we do not do proper due diligence because that is only for the financial services sector. Dameon, I wish you well. Try not to make the same mistake twice. No BVIslander should be denied access to any job, anywhere in the islands...my two cents. u hoping..have u found God..cha man! Congrats Dameon, make the best of this 2nd chance. To all the haters, it's really funny. They appoint a local, you chastise and pull him down. If they appointed an expat, you would be balling where are our locals. His girl got fired from the tourist board 2 days ago because she was backing R Lettsome of the 8th and the VIP. They give her NDP boyfriend a big job now? They know he with she? I doubt it. Damian, congratulation! Do your best and keep God first in all that you do. Don't mind the negativity! The person they alleged steal from CCT?? Really?? Wow! NDP at it's best again. Hmm... Every couple years he finds and lose God. Always on here with your pi.., like you have nothing to do, and crime rampant in the BVI. He and his new girl have stinky fingers. I heard she got fired yesterday! Keep cleaning your house Touristboard! He born here so let him work! Wow! What are his qualifications? well i guess he would stay outta jail now for not paying child support! It wouldn't of matter who they put in there everybody would have still be talking, elections done gone some months ago and we still here with this NDP/VIP thing, people got to eat and if anyone of use was offered the job and u wasn't working r currently working for less money they wouldn't think twice about taking the job. So Damien keep ur head up and do u thing my boy CUT THE CHECK! the school children say Elton got the recommendation but the Minister got Dameon the work...can we build a country this way? ...He had 2 more jobs since CCT..How VINO aint mention them!!!! Hope he pay them bills tooo..
who gon regulate the regulator? what happen the NDP falling apart??? I agree with you Mr. Blyden, if you as chairman of a board held interviews to find someone eligible to fill the post, which you all recommended Mr. Callwood, only to have your decision undermined by our government, then you might as well leave it to them. This government is truly corrupt man! Dictators indeed!!! I aint no one but do you all screen these people at all. This guy have a very bad reputation and every time he does some thing bad he run away from it. Im all for him working but I hope now that he wont have any more excuses as to why he aint supporting he children them. But he always seem to get these fools to trust him until something bad happens lets see what it will be this time. NDP you all taking a great gamle on this guy. So your reputation squeaky clean? Take the splinter out your own eye before you pass judgement. Sound like a know-it-all to me. This situation shows the inexperience of both Mark and his PS. If the government already had a candidate then what was the sense of conducting interviews exposing this minister to this embarrassment??? Just take your NDP political choice to cabinet and that’s that!!! Mark you need better advisors boss. Shara Palin how do you know that the PS did not advise Mark otherwise? If you know him very well you should also know that Mark takes advice from no one! So don't be so quick to find your scapegoat for this blatant, disrespectful act by the so-called Minister. Mr. Blyden, I applaud your bold stands on this, since NDP took office the country has gone backwards as everything is policks which will destory us all. thanks for bringing this to light Blyden, since the NDP got in this crap is happening across the board. NOT LONG! HOW LONG? NOT LONG!!! Come on ease up off Dameon, if they could hire tracia at the college why they cannot hire Dameon at DMV? He need to pay his child support..............how this man land this job, he isn't even qualified.